Hello from Capt. Tony Murphy. 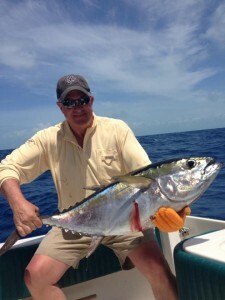 Thank you for your interest in my Key West Fishing Report and Fishing n Key West and the lower keys.! Light winds and mild weather will be here through the holiday week-end. Temperatures have bounced back up in the mid to high 70's after a couple of cool weeks. This has helped the flats to warm up enough for Permit and Bonefish to be spotted moving across the shallows and back country ledges again. This time of year getting out a little later with the sun up higher gives you a better chance of coming across Bones and Permit. Darker colored crab patterns in tan or olive work great this time of year. Few juvenile Tarpon are still being spotted along mangroves edges chasing schools of baitfish too. Dark colored baitfish patterns, toad patterns and even gurglers work for these guys early in the morning or late evenings. Getting a little deeper in the back basins will give you a good chance of finding large jacks, Cudas, Sea trout and even Mangrove snappers in an abundance. Live bait is always "king", but any dear hair jig or Gulp jig will do nicely too. Look for deeper ledges in the basins and be patient, these fish move in schools and cover a lot of ground. Offshore remains steady with mix bag of Bonita and Blackfin Tuna. Many captains are seeing schools of Wahoo and large King Mackerel all up and down the wall outside the reef in 100 to 200 feet of water. With the amount of bait offshore, a lot of the deeper species have come in tighter to the reef line allowing the yellow tail catch to stay busy. This time of the year the reef can be very productive if the weather allows for a trip out. With the mild weather this week, offshore trips will be on fire with the amount of bait pushed out last week. Remember Grouper season is coming to a close, so now is the time to finish the year off strong with some of the best tasting table fare. Merry Christmas and Happy Holidays!!! We wish you tight lines and fish boat side from the staff at The Saltwater Angler! 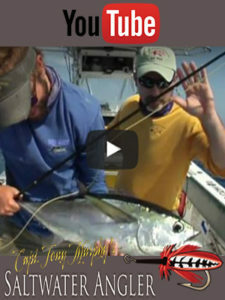 Visit us weekly to get your Key West Fishing Report! Fill in the form to book a fishing trip with Saltwater Angler Key West or you can call us at (800)223-1629 or (305)296-0700.